We’re pretty blessed living in Maidenhead as we have so many areas right on our doorstep and the south coast is tantalisingly close. 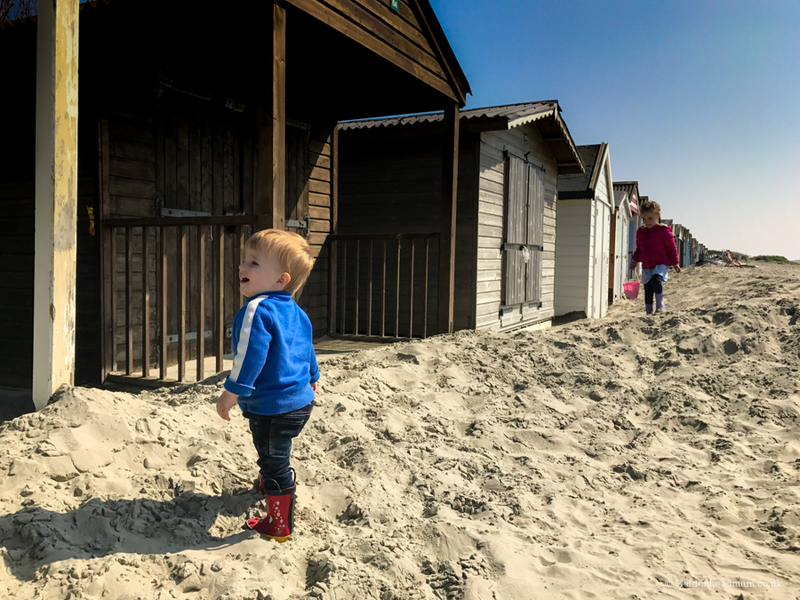 I often hear people from Maidenhead rave about West Wittering beach so when we found ourselves staying nearby I thought we should check it out. 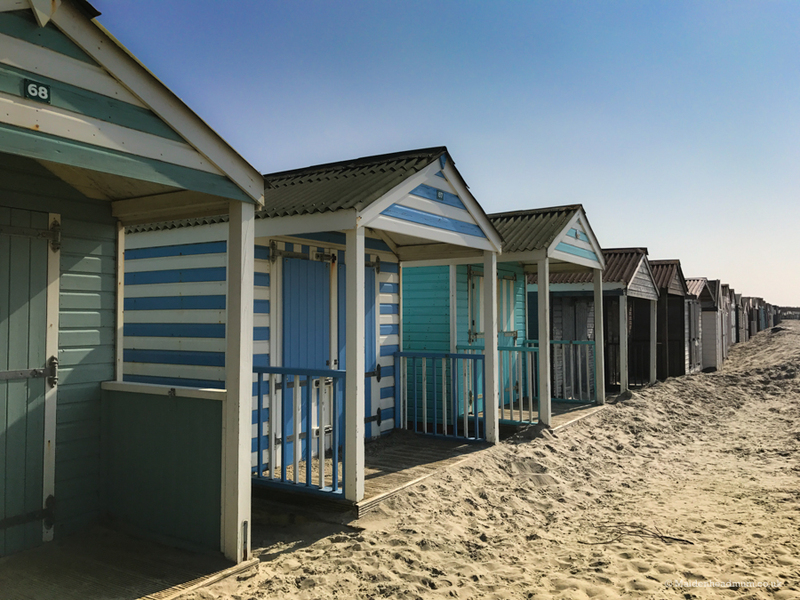 West Wittering beach is a beautiful stretch of unspoilt coast near Portsmouth and Chichester. 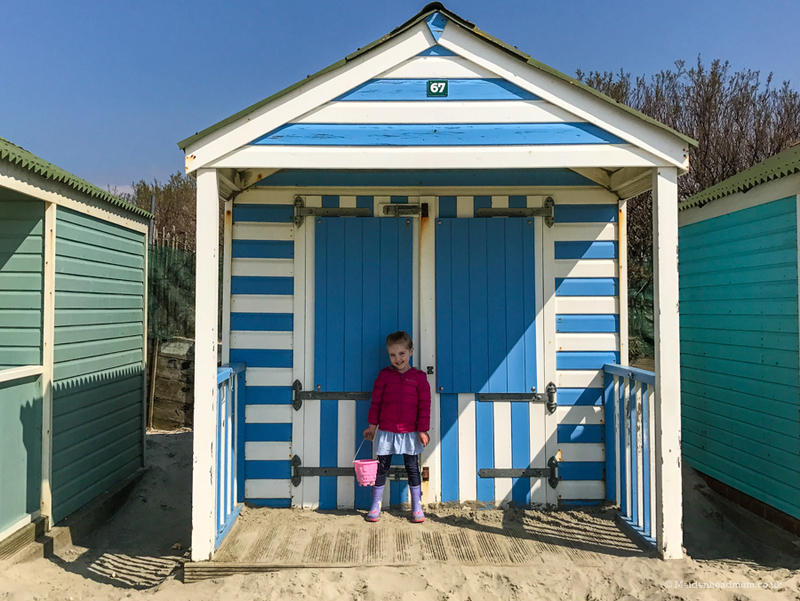 There are sand dunes, beach huts and unpolluted sea water – it’s pretty much the beach of your childhood daydreams. We visited on a sunny day in April which was still rather chilly, so we went in jeans, coats and wellies. Last year we went to Camber Sands and had to huddle in a pop-up sun shade tent to shelter from the wind while we tried to eat our lunch. Although West Wittering was a bit cold, there wasn’t much wind which made the day a whole lot easier. The beach has soft white sand, and there is plenty of damp sand for optimum sand castle construction. 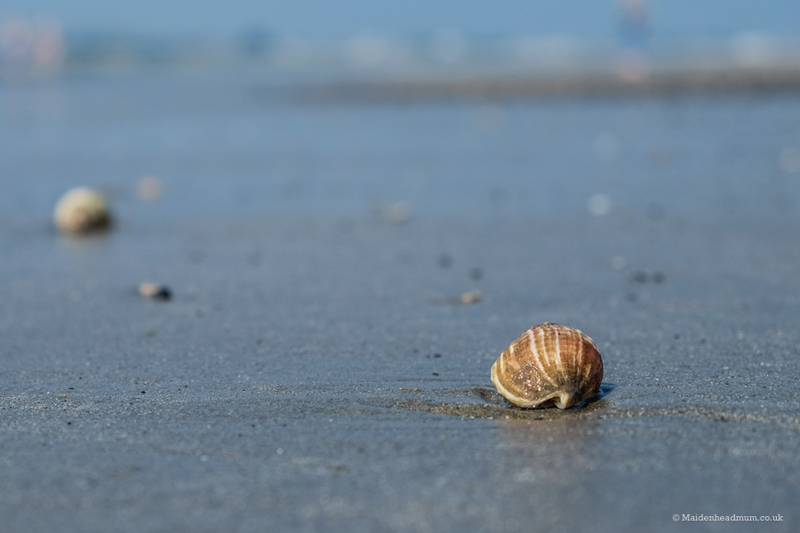 You don’t have to walk too far to paddle or swim in the sea, and there are lots of shells to find and collect. The beach huts looked beautiful in the sunshine. I wanted to do an entire photo shoot just with the huts, but sandcastle duty with the kids was calling! We made it to the beach by 10am and it was pretty much deserted. However, this was the week before Easter in April – I imagine it’s much busier in summer. Make sure you bring your bucket & spade! When the tide goes out there are plenty of shells to be found. There’s a rather lovely story about the beach. In 1952, residents clubbed together to prevent the lands from being sold to a developer. They raised £21,000 which is the equivalent of several million pounds today. 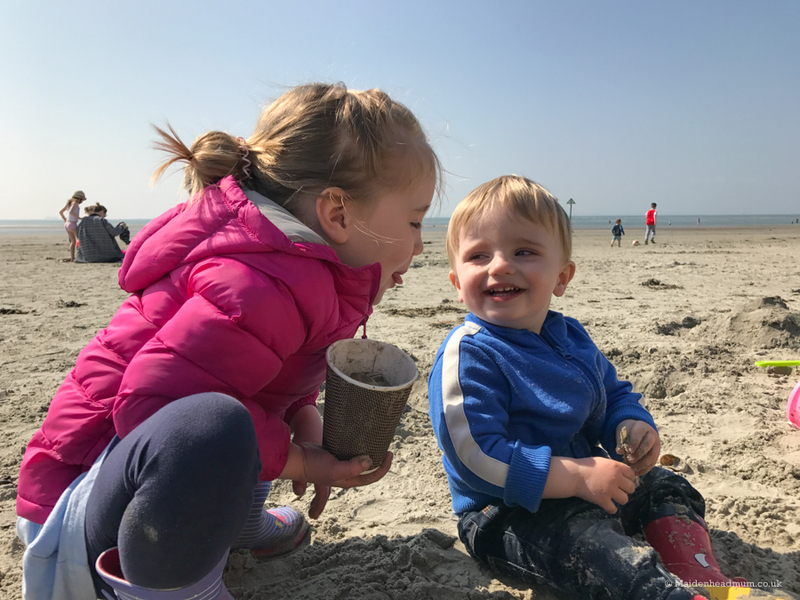 The West Wittering Estate’s 250 hectares of wet and dry land is now safe in the hands of around 300 individuals, most of whom live locally. When you visit the beach, the facilities and the cafe, there is a sense that you’re in a place where people genuinely care. All the staff we encountered were helpful and polite. Even though it was sunny we wrapped up in winter coats. 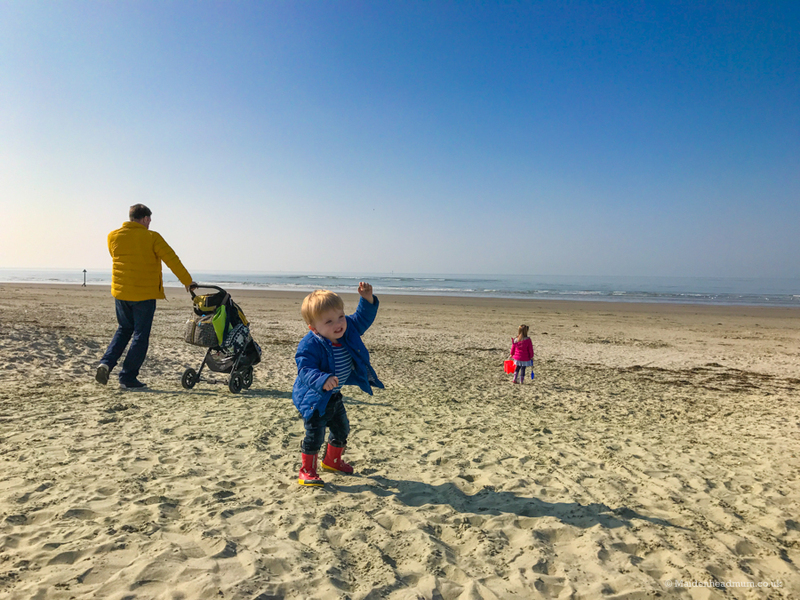 I’m quite fond of a ‘winter beach’ experience with under 5’s – it’s a lot less stressful than having to re-apply suntan lotion on squirming kids! My daughter was fascinated by the ‘twirly’ shells. Wellies, hat, proper coat. This is hitting the beach, British style. 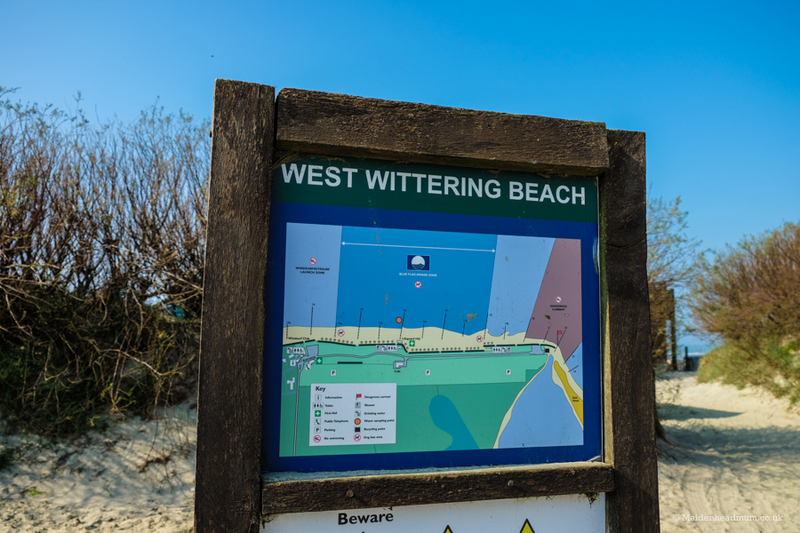 Where is West Wittering beach? If you draw a straight line down from Maidenhead to the South coast, you’re pretty much there. 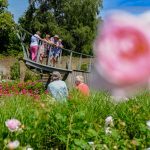 Except you can’t drive in a straight line to get there: one route is to head towards Reading and then down past Basingstoke – more scenic than the M25 option! Google maps say’s it’s around 1 hour 40 mins to get there, but I think you’re best to allow 2 hours. It’s tricky to confirm if it’s the closest beach to Maidenhead for sure, but it’s worth a trip to explore. A map of the beach. You get to park so close to the beach which makes access quick and simple. No need to drag stuff over sand dunes. 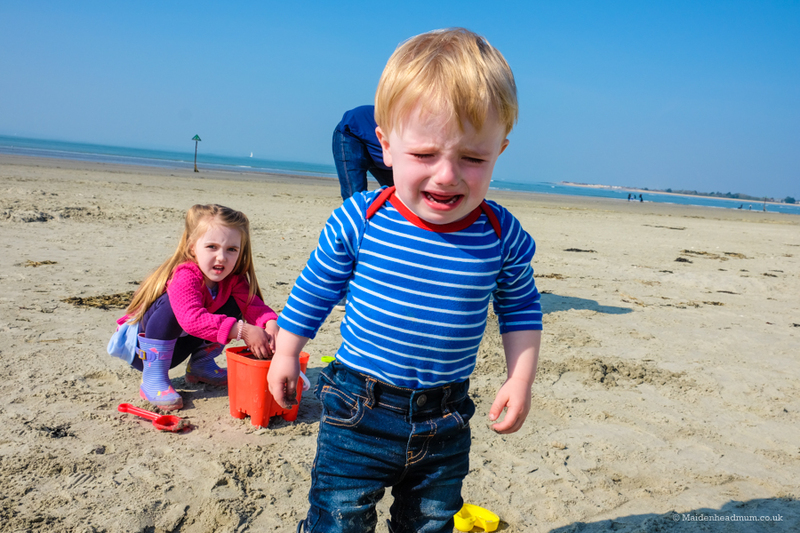 My youngest was 20 months old, and was a little overwhelmed by the beach at times. He almost had too much to do! He enjoyed running around the beach huts though. Posing in front of the blue hut. I’d love this one! 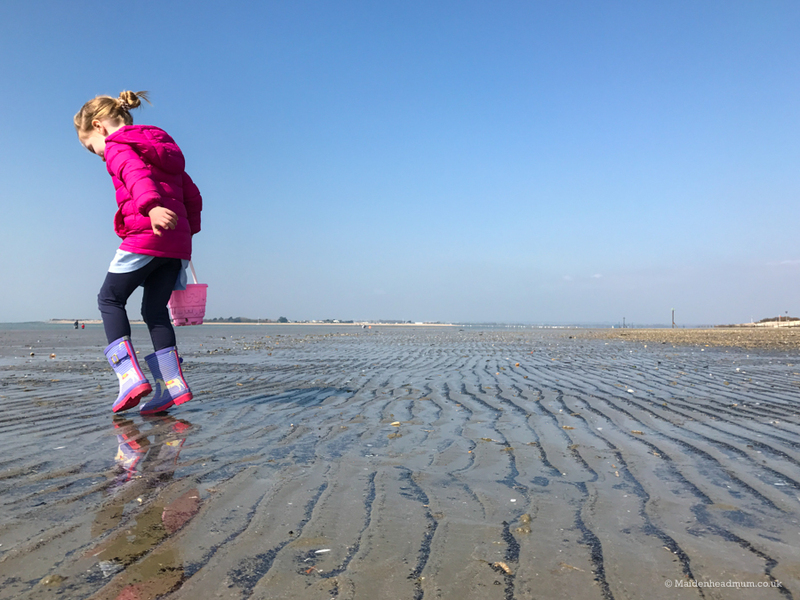 Is West Wittering beach easy to get to from Maidenhead? 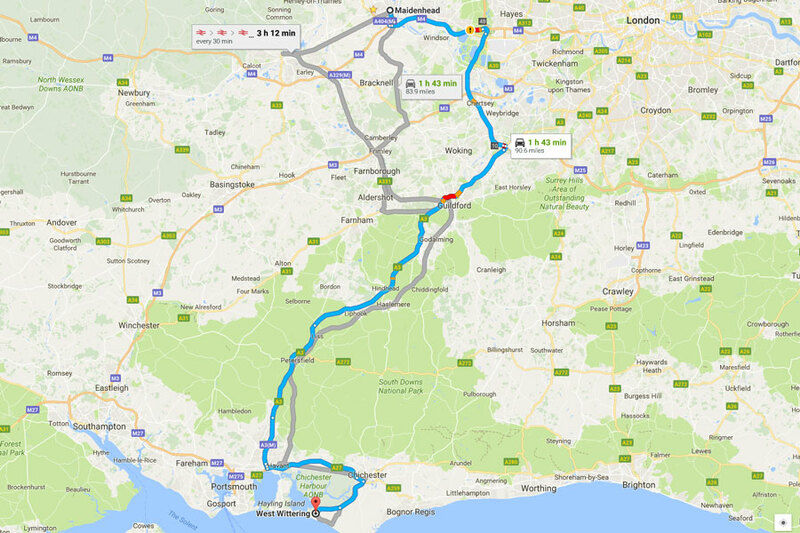 The Google-suggested routes from Maidenhead to West Wittering. It depends on what your ideal level of fun/faff and driving is. I’m pretty much a zero tolerance person when it comes to faffing. 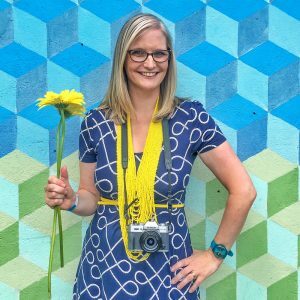 I have two children under 5, and I need things to be as simple as possible. To be honest, I can’t imagine popping them in the car and driving there and back in a day, but I know lots of people that have done exactly this. I LOVE the idea of a beach, but much prefer being able to stay close to home if I can. 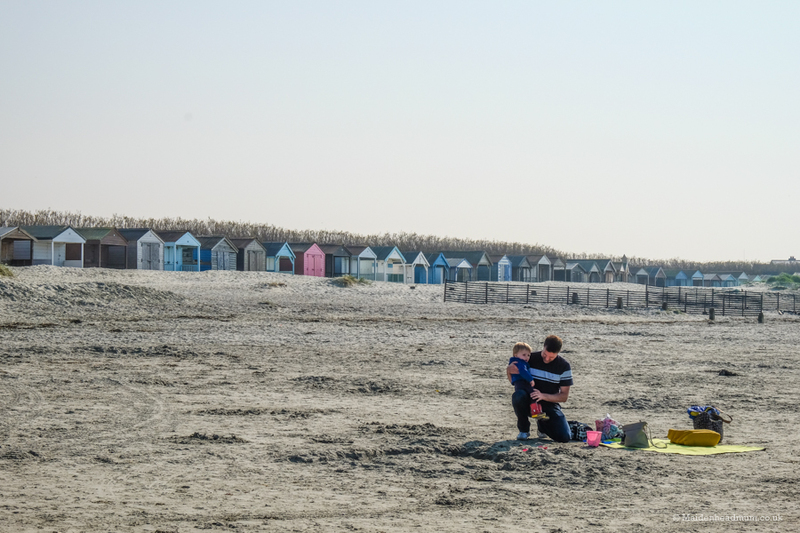 We visited West Wittering while we were staying at a caravan park in Pagham which is about 25 minutes away. 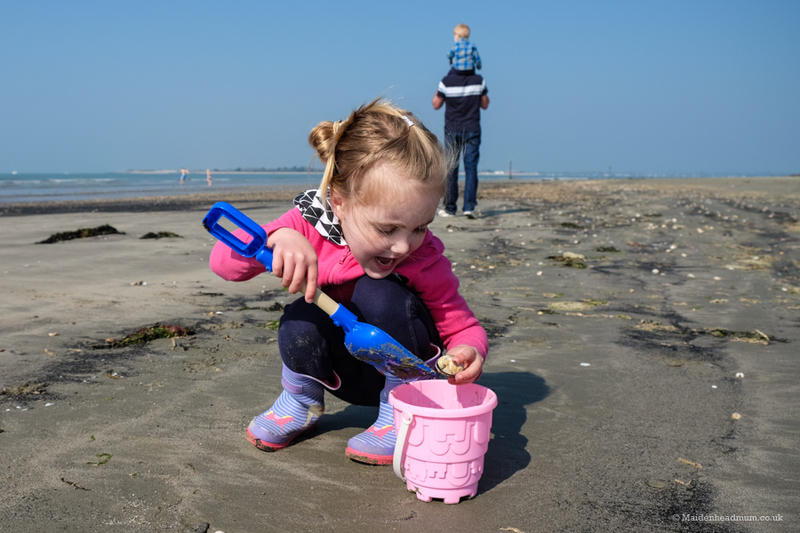 Once you arrive at the beach and park it’s a short walk to the soft silky sand, and you don’t have to try and push a buggy through many sand dunes to get to the right spot, it’s all easily accessible. Let’s be honest, buggies and sand are not the best of friends. We found West Wittering beach to be quite manageable though. No idea what the Little Man is doing here, other than being thrilled by the sand! 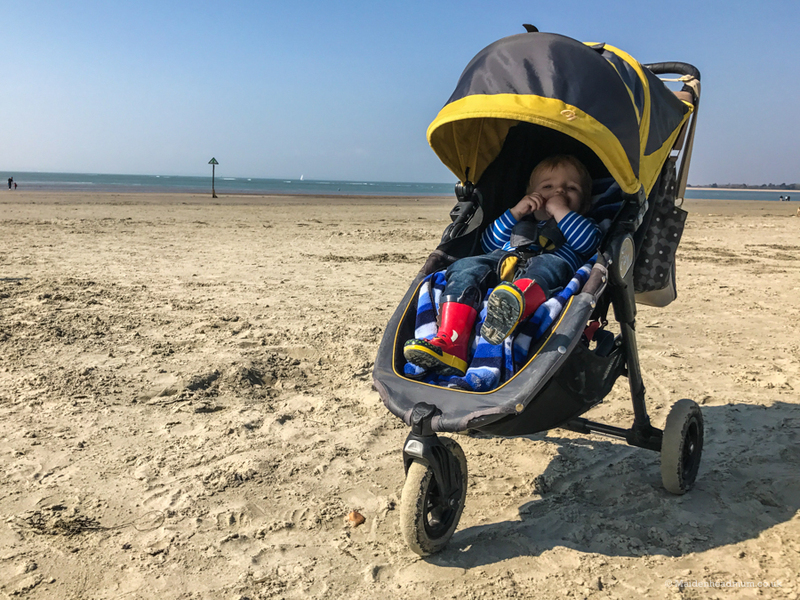 When the little one started to get grumpy I put him in the buggy and went for a walk on the firm, wet sand. He enjoyed watching the world go by from his shady spot. 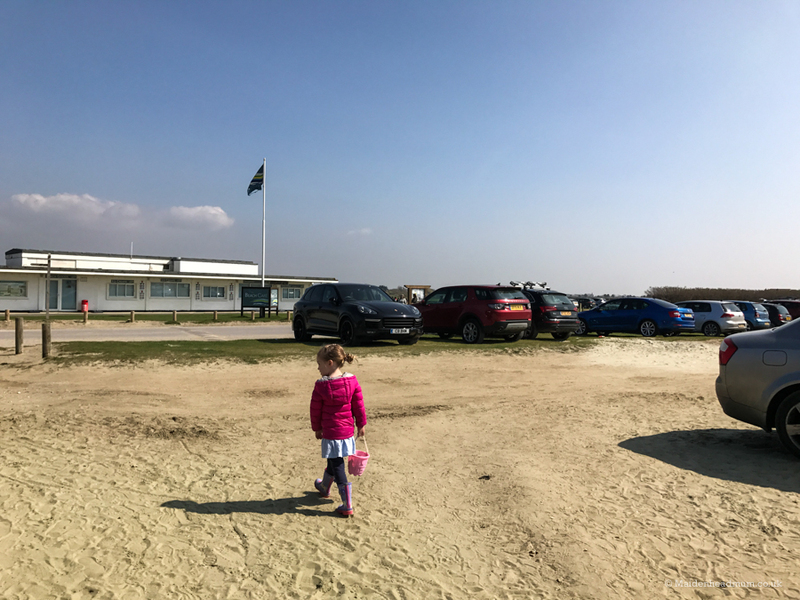 What’s parking like at West Wittering? We visited during the Easter holidays when the weatherman got it completely wrong: grey, cloudy skies were replaced with dazzling blue and sun instead. Despite being sunny, it was still cold, so hardly peak beach weather. Arriving just before 10, we had the beach to ourselves, and it was incredibly peaceful and beautiful. We left by 1 pm, and the beach had become much busier. At this point, around 50% of the parking had filled up. I’m not sure how busy this would get on a bank holiday weekend. Arrive early for sure! There are barriers at the car park. The surrounding land is privately owned, so there isn’t much other parking unless you are willing to walk 15-20 minutes from the main public road. A short stroll from the beach and you’ll see the cafe which has lots of benches where you can sit and enjoy your food in the sunshine. Some people I have chatted to are happy to drive there and back in a day, but we stayed on a nearby Haven Caravan site at Pagham, and we rented a lovely mobile home from a local Maidenhead lady. It was about 30 minutes drive from there which suited us perfectly as the little ones had a short morning nap on the way. We saw a few other campsites and BnB’s along the way, too. Scotts Farm or Nunnington Farm for ‘proper camping’ in a tent, caravan or mobile home. Wicks Farm for camping, hiring a holiday home (static caravan/lodge) or camping pod. I counted 16 loos in this block just on the ladies side! 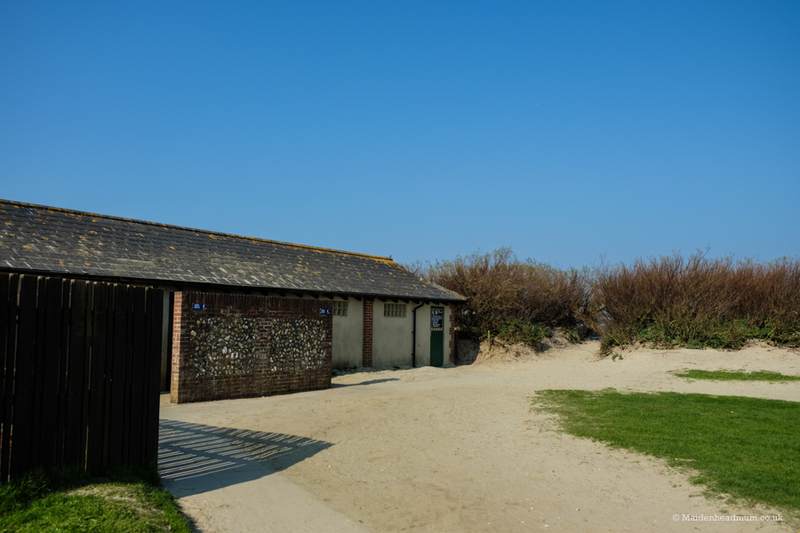 There was a large toilet block at the beginning of the beach, just as you enter the car park and then another by the cafe. Both had multiple (clean) toilets which were free to use. It sound’s daft, but it’s the little things like this that can make or break a day at the beach for me. 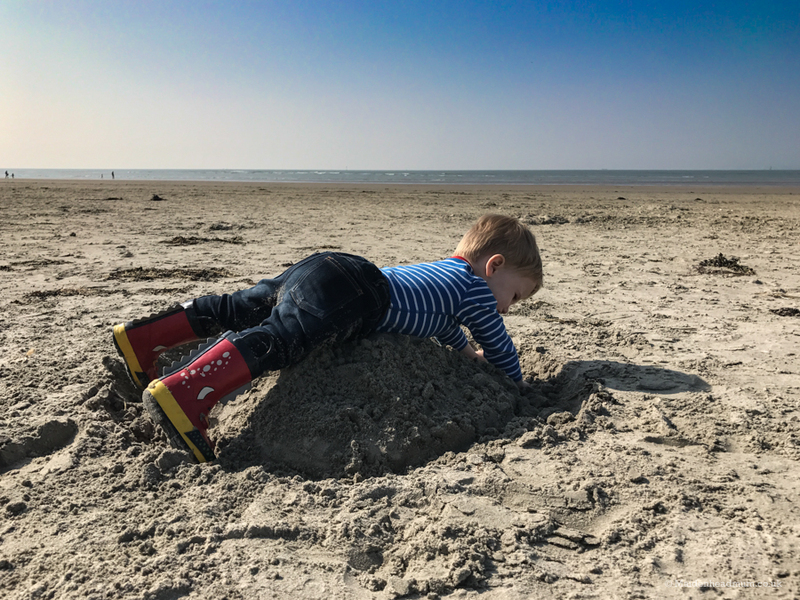 Once you’re on the beach, it’s pretty quick to nip back and use the facilities which are handy when you have small children like us. The cafe served teas and coffees, and there was a van next door serving burgers, chips and other hot food. The bacon smelt amazing when we arrived, and I was tempted by a bacon sandwich, but at £4 I decided to be good and eat a snack from the packed lunch I’d prepared. There is a small shop where you can buy beach paraphernalia. As it was so early in the season when we went, this wasn’t open, but we were able to get a bucket and spade from the cafe instead. We took a picnic onto the beach which we ate by 11am, which seemed to be about the latest we could wait for lunchtime on any day of our holiday! 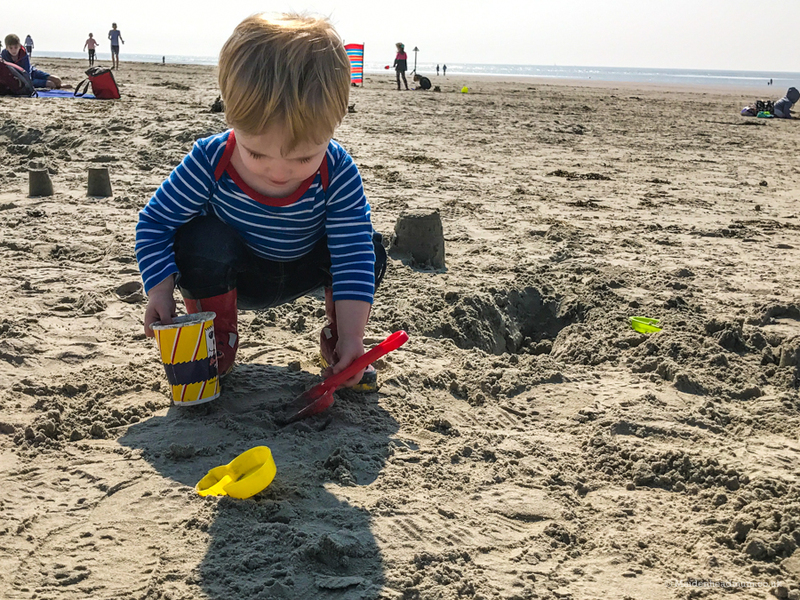 The Little Man enjoyed trying to build sandcastles. 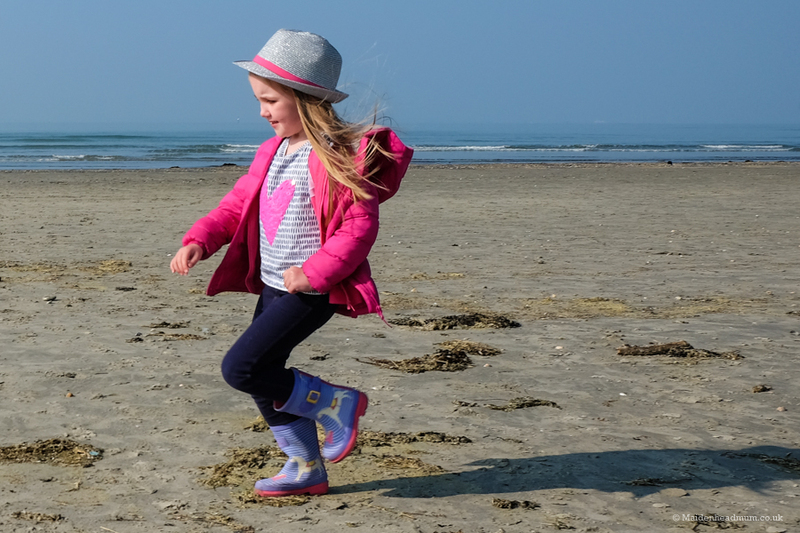 You get to the beach by driving through the West Wittering Estate which is all private land. 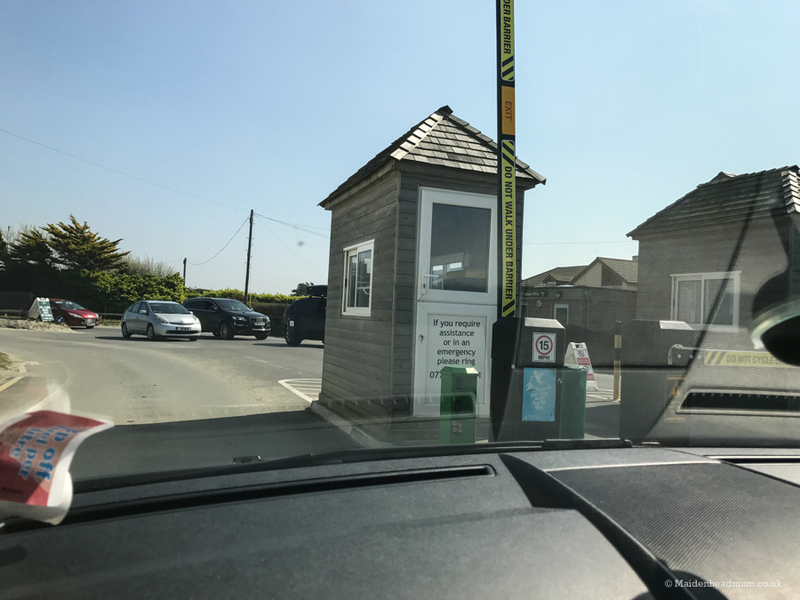 There is a toll gate on the car park, and you pay £4.50 for a day’s parking which ends at 8.30pm. Other than that you’re pretty much good to go: you don’t have to hire a sunbed or parasol, and the toilets are free to use. You can save pennies by taking your picnic, or you can choose to eat at the cafe opposite the beach. 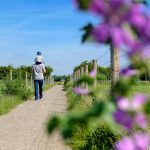 We also spotted some lovely pubs on the way from Pagham, and another reader has mentioned the Shore Inn as a great place for a spot of lunch. Be warned though, if you leave the car park by car you’ll have to pay to park again on your return. 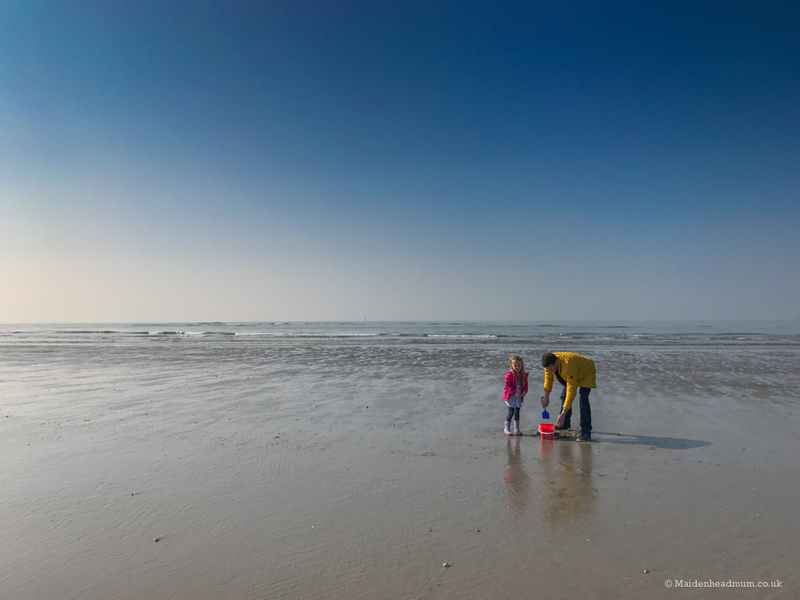 One of the best things for me is that beaches are a magical place for little people. They seem able to occupy themselves pottering around building sandcastles and looking for shells. West Wittering is perfect for that. 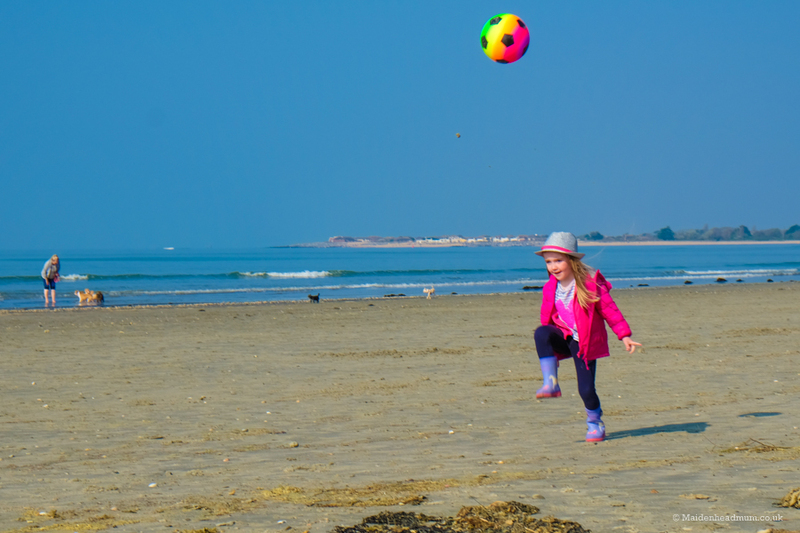 Having a kick around with a rainbow football. Exploring for shells and jumping in puddles. 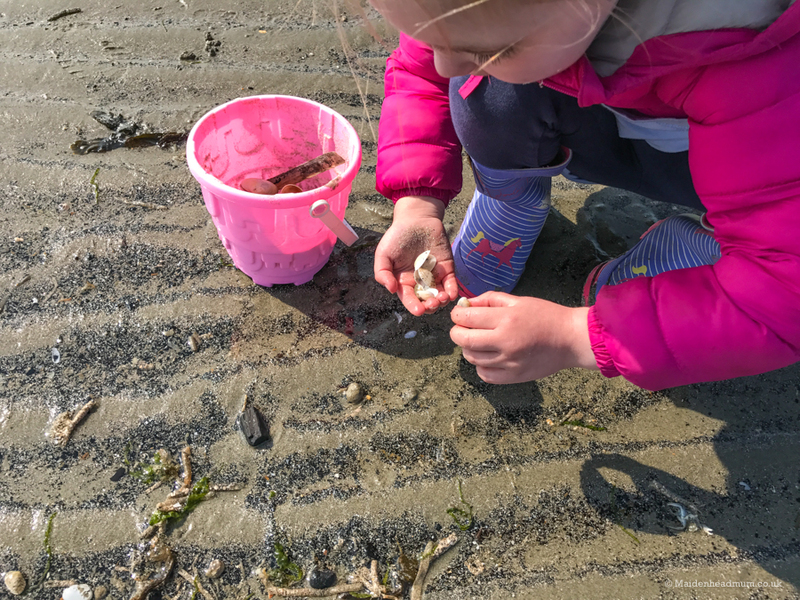 My daughter liked finding all of the ‘clammy shells’ and putting them inside one another. Little Man invented a new game of sandcastle straddling. Yep, it wasn’t all plain sailing. We think he was upset because he couldn’t do all the things that his sister was doing. But we’ll never really know! Happiness quickly restored with the siblings bonding over silly faces. Both my husband and I were impressed. It’s rare to find such a clean and well-maintained beach that ‘just works’. Lovely soft sand which was great to walk on (no pebbles to be seen here!). The size of the beach and the easy access car parking meant that you could drag your buggy and all your other beach stuff onto the sand without too much trouble. I remember looking up at one point as the children played in front of the backdrop of beautiful beach huts and it all felt so timeless. The Spitfire looping overhead added to that even further. 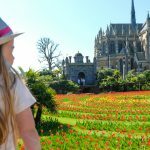 We had a fantastic day, and I wouldn’t hesitate to recommend it to anyone else. Thankyou for sharing. We have just come back from our favourite holiday haunt Polzeath in Cornwall. Great for surfing. Our coastlines are just beautiful. Our coastlines are beautiful, our weather a little questionable! I will have a look at Polzeath too although I love the locality of West Wittering for Maidenhead: it’s so handy being a short drive away!